Life after having a baby is never the same. You never know what each day will bring. You never know what to expect. You never know how a little one can so radically affect your life. You never know how much you can love someone until you experience life after having a baby. But being a parent is exhausting too. You have no time or energy to cook or eat properly. But still i somehow try to make time for cooking good food. I am one of those who find their comfort in eating. 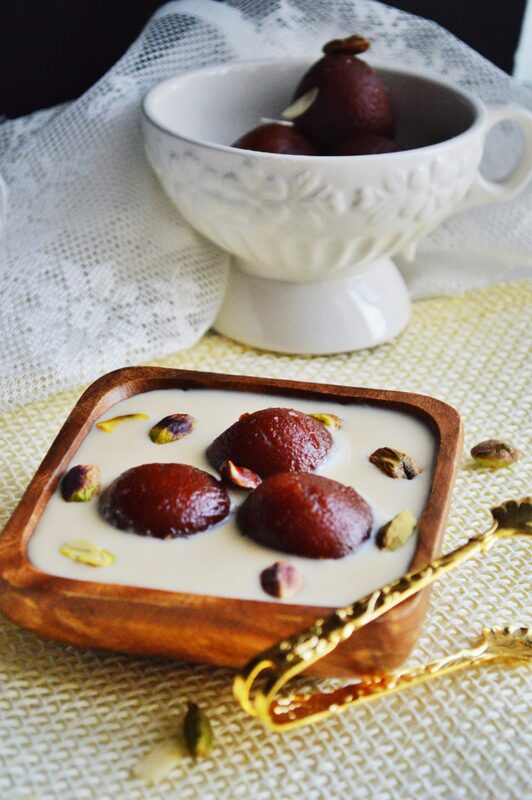 Eating food which I love, mostly sweet, and this brings me to the recipe of today which is Gulab Jamun with rabri. 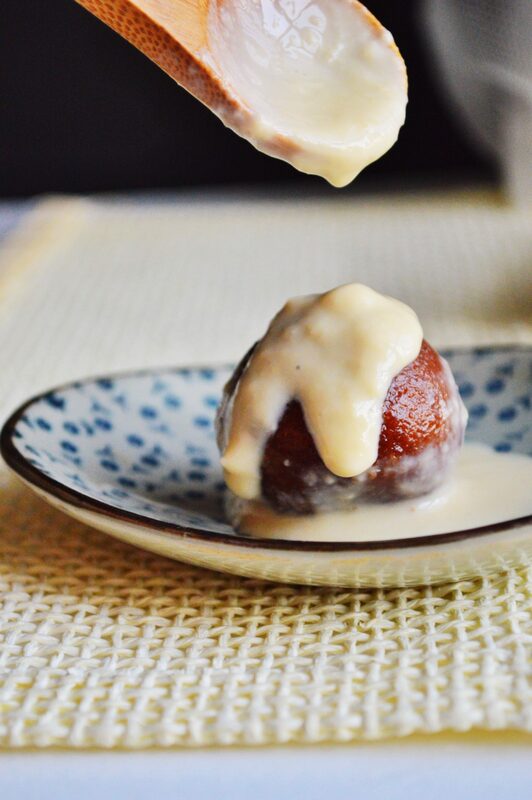 To define the term gulab jamun: It is a Deep Fried, Melt in the mouth kind dough balls dunked in sugary,rosewater & cardamom syrup – its pure bliss to gobble these up especially when slightly warm. 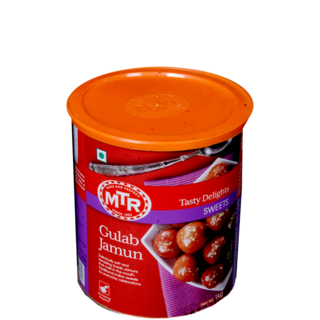 “Gulab” means “rose” in Hindi and “Jamun” is a south asian fruit which has a similar shape & size – that is how the sweet gets its name. These jamuns are an Indian version of doughnuts. To make them extra special, once fried and soaked in sugar syrup they can be drizzled with the amazing flavour of rabri. What is rabri you ask? In India traditionally, we don’t have heavy cream, single cream or half and half kind of things with different butter fat ratios. Instead we have one cream called ‘malai’, which is simply made by slowly heating full fat milk over a long period of time, evaporating the water content and leaving behind heavenly creamy reduction. 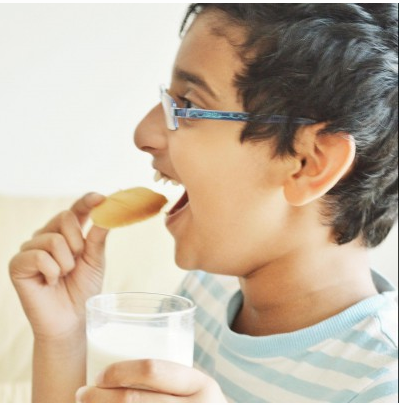 Rabri is a form of sweetened reduced milk flavored with nuts and spices. 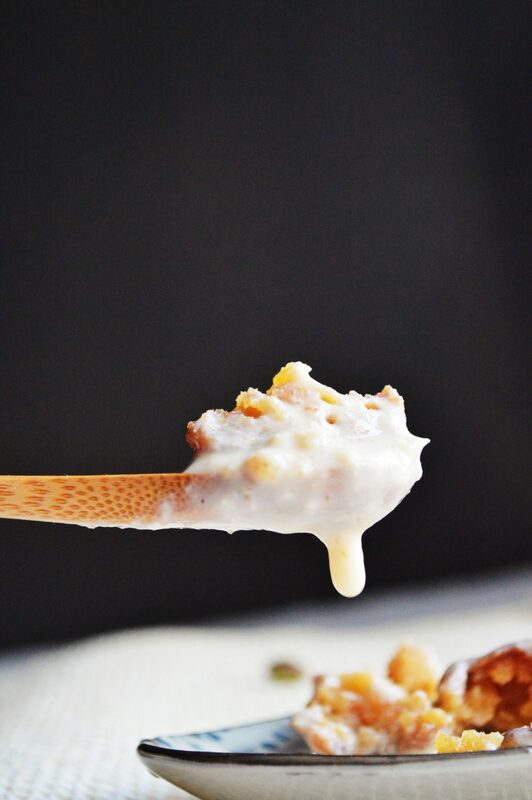 The slow heating creates a distinct nutty flavor which is what really makes this dessert so incredible. Hope you shall enjoy it as much as we do. 1. Take the milk in a heavy bottomed vessel and heat it. 2. Keep stirring occasionally until it is reduced to about half the quantity. This might take about 45 minutes. 3. Add the sugar and cardamom powder and boil it for another couple of minutes. 4. Switch off the flame and let it cool completely. By then the malai should be thick. 5. Add the chopped nuts and refrigerate it for sometime. 6. Serve this rabri with warm or normal gulab jamuns. ✔️I had bought readymade MTR gulab jamun as i didn’t have the time to make it from scratch. But it is not so difficult to make these delicious dessert at home. 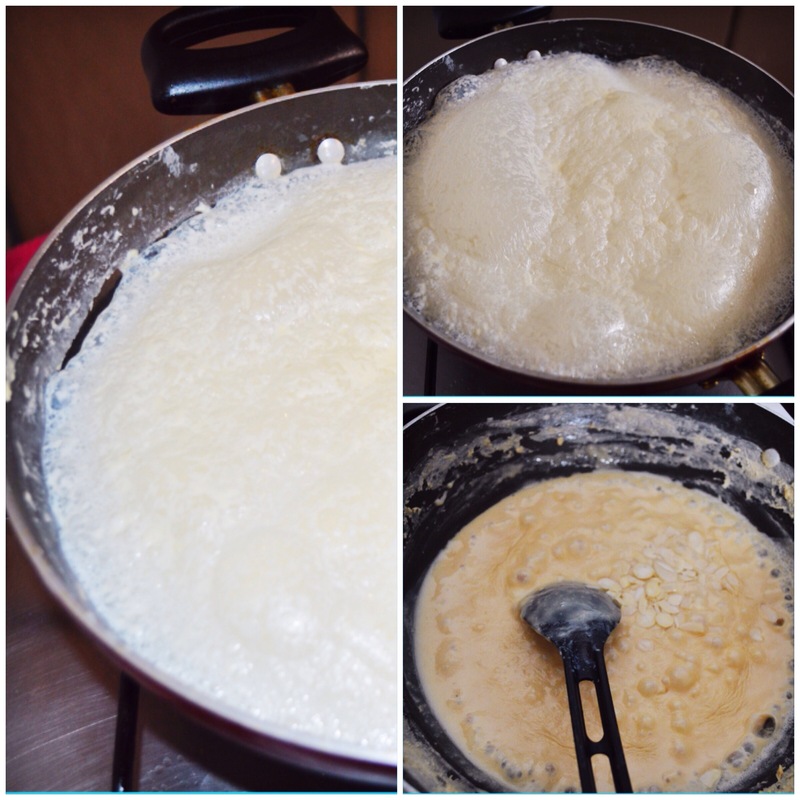 It can be made with mawa/khoya or with milk powder. 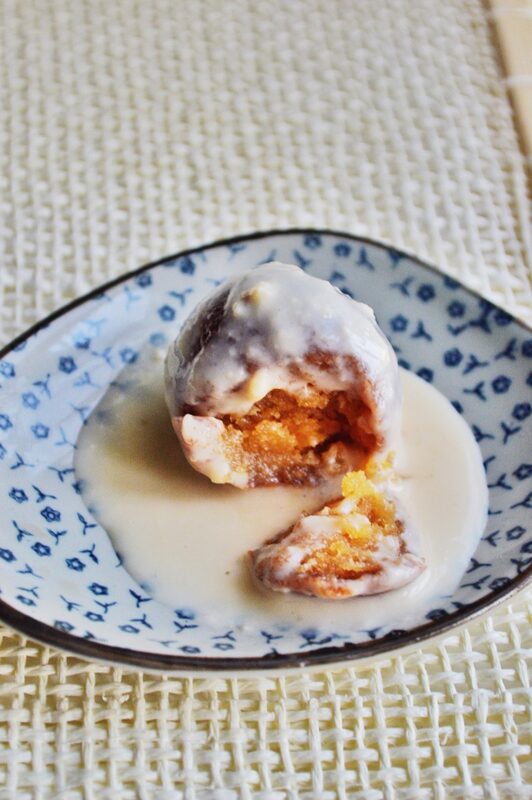 Get the recipe of gulab jamun made with milk powder from Tanvi’s site named sinfully spicy. 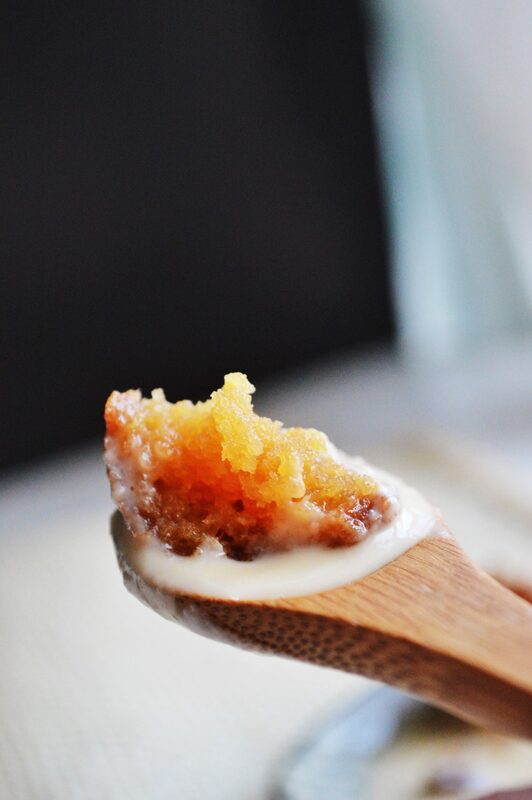 Check out her other recipes too, she has got an amazing blog. Take the milk in a heavy bottomed vessel and heat it. Keep stirring occasionally until it is reduced to about half the quantity. This might take about 45 minutes. Add the sugar and cardamom powder and boil it for another couple of minutes. Switch off the flame and let it cool completely. By then the malai should be thick. Add the chopped nuts and refrigerate it for sometime. Serve this rabri with warm or normal gulab jamuns. I must try your recipe, they look amazing. I had them once at the Indian Day Parade in NYC. There is block after block of food tents set up and I saw these and fell in love. Syrupy sweet and delicious. 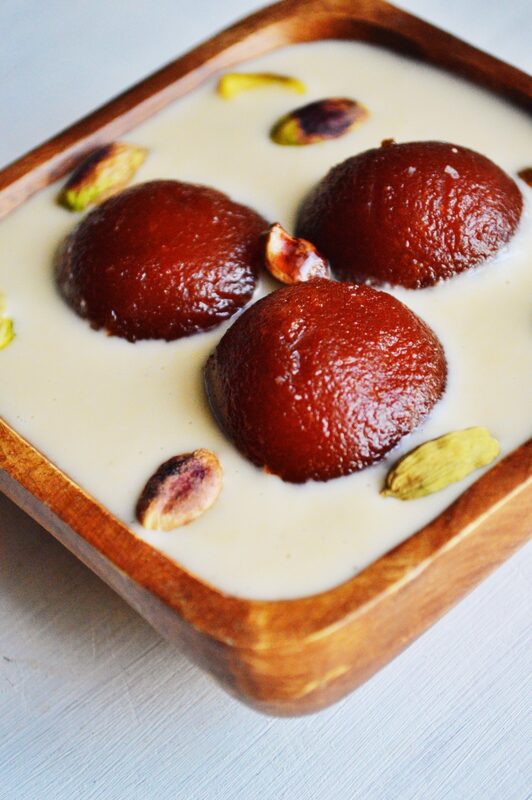 Yeah this is the king of Indian desserts. 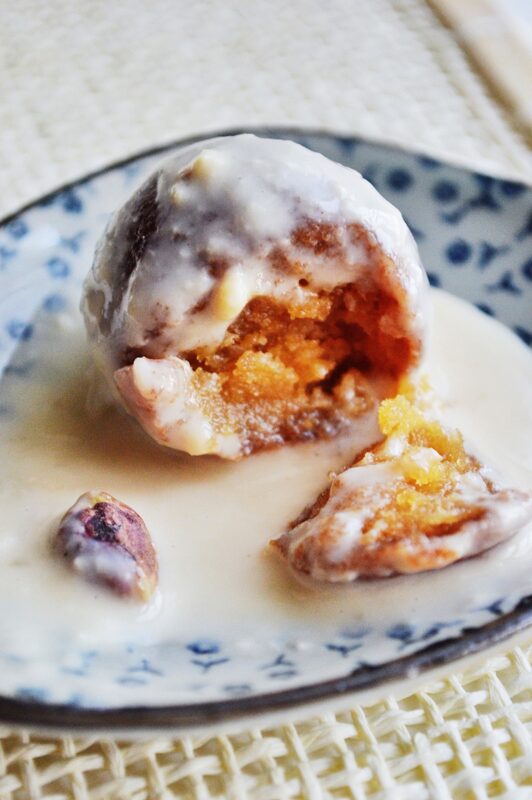 Its even yummier when you eat the gulab jamun with the creamy, thick and sweet rabri. 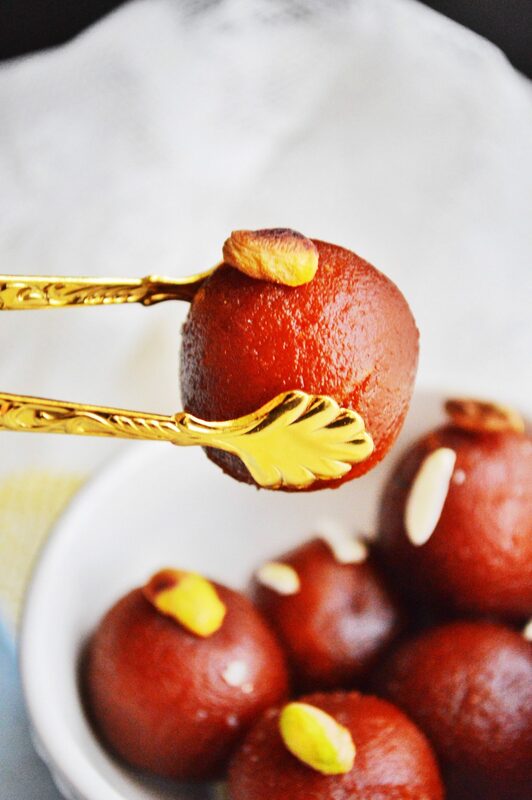 Gulab jamun – one of my most favourite desserts. Never had with rabri but the combination sounds absolutely divine! It looks delicious and so decadent! My sister says the same by the way- she has two children and she told me it changed her life, especially when they were little. I think it will get better with time 😀 I keep my fingers crossed! Hahaha yeah I’m sure it will, once you get used to the routine. Haha thanks Bonnie. It sure is a struggle to take pictures when you have a baby. My beautiful boy will be 13 very soon but i remember it all very well!! I don’t think we would forget these times ever, especially with your first baby. 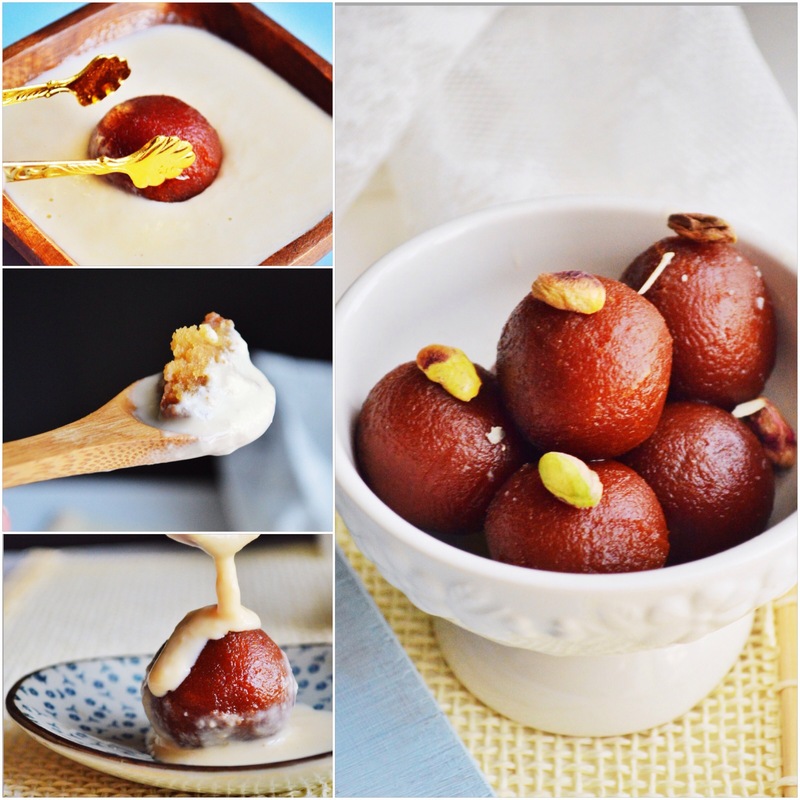 I cannot stop drooling looking at these gulab jamun and rabdi pictures! Bowing to thee, Superwoman 😀 As if those perfect Gulab jamun are not enough, you have smothered them in that luscious rabdi, OMG!!! I wish I were ur neighbour! Thanks mrsgrg! So true. If you manage to cook good food after all the looking after, you feel soo satisfied and happy at the end of the day. They look amazing! I especially love that photo with the gold pincer!